In my year end series of the top 5 most viewed blog posts on this site, another older but goodie comes in at number 3. And the good news is : opening day of the 2016 season is just over 3 months away. Enjoy! Rob The final day of the All Star Break is today. I thought it would be a good time to fill the baseball void with a sports portrait from my wayback file of Virginia high school pitching phenom Doug Newstrom. Doug Newstrom was the the ace of the pitching staff for the W.T. Woodson varsity baseball team in Fairfax, Va. Woodson had won the Virginia State High School League championship in 1989, with a nearly perfect season. Woodson was primed to repeat this feat in 1990. Our paper, The Fairfax Connection, decided to feature Doug in its Baseball ’90 Preview section. During an editorial meeting leading up to the preview section I suggested that since Newstrom had a blazing fastball, we should take a portrait of him holding a burning baseball. Often when I show this photo to friends, they say, “nice job of Photoshopping” This photo was actually shot before Photoshop became commonplace. In fact, according to Wikipedia, the first version of Photoshop 1.0 was not released until 1990. No trickery here. Everyone agreed the burning baseball was a good idea. Now, we just had to sell the concept to Doug and his coach. At that point in time, Doug Newstrom was one of the highest regarded pitchers in the state and he was well on his way to being drafted to play professionally (which he was) and be recruited by a major division I baseball program which he also was. Doug and his coach, Woodson’s Lee Knupp, signed on with the concept and we were set to go. So myself and our fantastic sports editor Norb Garrett headed to Woodson to meet the coach and Doug on early spring afternoon, armed with a few baseballs and a can of butane fluid. It turned out to be a windy day. 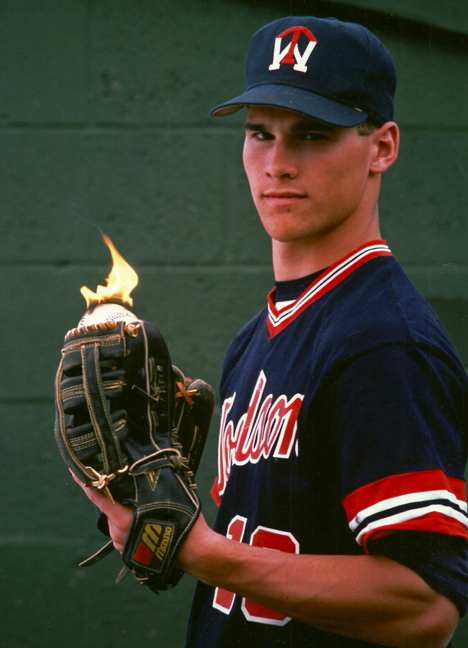 Every time we would pour the butane on the baseball atop Doug’s glove, the flame would go sideways. We kept at it until we got the desired effect. Doug was great during the entire session and kept a straight face as his coach who seemed to enjoy the shoot as well, was smiling next to the dugout as the wind refused to subside and we kept on dripping butane on the baseball. Looking back, I can only say thank goodness the flame never spread beyond the ball. I did not want to be responsible for derailing Woodson’s repeat effort or Newstrom’s pro career for that matter. This photo never ran in color as The Connection in 1990 seldom if ever used color, so this is the first time this version has been published in color. Doug Newstrom went on to have an incredible season in 1990 and W.T. Woodson won its second consecutive Virginia state championship. He was drafted straight out of high school but chose to play for Arizona State and then was drafted a second time and played professionally for about 8 seasons. Coach Knupp, who graduated my high school, Fairfax High, is one of the winningest baseball coaches in Virginia high school history. He coached for more than 30 years and won close to 400 games. The 1989 and 1990 Woodson seasons were a lot of fun to cover. To read an interesting post on Doug Newstrom and Northern Virginia Baseball in the late 1980s and early 90’s check out this link NOVA Baseball. I want to give a special shout out to Todd of nationalsarmrace.com. I used his site as a fact source for the majority of this blog post. If you like baseball, particularly the Washington Nationals, you will really enjoy Todd’s site. He does a great job. In addition to his material, the site includes a great variety of links to other sports Web sites.